After posting a portrait of Mary Wollstonecraft yesterday, today I decided to post one of her daughter, Mary Shelley. 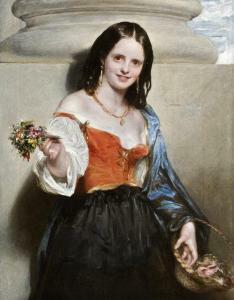 Richard Rothwell (1800-1863) was an Irish portrait painter. Born in Athlone, he studied with the Royal Dublin Society (now just called the Dublin Society) from 1814 to 1820 when he won a silver medal. 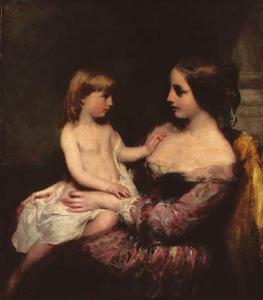 He moved to London and became an assistant to the celebrated painter Thomas Lawrence. Rothwell's reputation grew thanks to his association with Lawrence. When Lawrence died, Rothwell completed many of his unfinished works and was one of the most popular up and coming artists in Britain and Ireland. However, in 1831 he took an ill-timed trip to Italy to study art and expand into history painting. When he returned to London in 1834 he found that his reputation has evaporated. Rothwell still had a moderately successful career, but never reached the heights that had been expected of him. Rothwell did many traditional portraits, and shows a great deal of sensitivity in his work. This canonical portrait of Mary Shelley is Rothwell's most enduring piece. Rothwell successfully captures the great writer's gravitas and intelligence. With the simple background and dark dress, Shelley's face and pale skin stands out in stark contrast. The most striking element is probably her sad, heavy eyes. She appears very wise, and perhaps too knowledgable about the pain of the world.